Can you put a price on money? Well… yes, of course! The Commonwealth of Australia’s first ever banknote is worth ONE MILLION DOLLARS. Denis Walter was lucky enough to take a peek on Friday’s program. Belinda Downie sat down with Denis to talk all about it. As well as bringing in Australia’s first bank note, Belinda also brought with her Australia’s first coin. 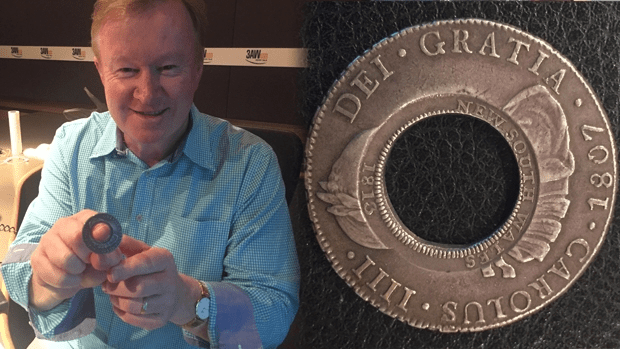 Denis holding Australia’s first coin, the Holey Dollar worth $500,000. You can see the display at the Melbourne Money Expo at Melbourne Park Function Centre.